Illinois CRP Mixes are specifically designed to meet the Illinois Conservation Reserve Program standards. Each state has standards specific to their own state. It is important to purchase seed mixes that satisfy your specific seeding plan. If in doubt on what to purchase or you have questions, don't hesitate to call one of our seed consultants for a free consulation. 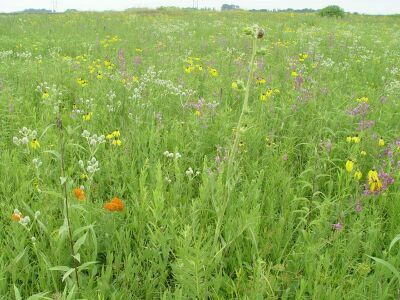 This is an attracting blend of tall prairie grasses with a heavy dose of wildflowers (forbs), predominately nitrogen producing legumes, which will attract and host a large population of insects. With more insects, there are more pheasant chicks. It’s that simple, because baby chicks only diet their first 4-6 weeks of life is…insects, of course. This mix provides early grazing with a cool season grass, while short statue bunch warm season grasses provide the open ground area so important for the tiny Quail chicks. And, the quail get all the cover protection and nesting material they need. This mix will stand like an oak tree during the winter blizzards. A wonderful splash of wildflowers (forbs) generates tons of insects to assure that chicks stay fat and healthy. Don’t try to buy this mix out of a consumer prairie catalog unless you’re prepared to pay several hundred dollars per acre! Features three cool season grasses that have been the farmer’s choice almost forever--offering great species diversity. One is an extremely early bunch grass, the second a medium maturity sod former and the third is a late maturing grass. They’re combined with your choice of an early flowering legume (alfalfa) and a late flowering legume (red clover) to bring in the insects by the droves for the chicks. You cannot go wrong with either the modern, disease resistant alfalfa or the red clover legumes available in Farmers Choice. They’re two of the most popular, time-tested legumes ever -- chosen by farmers over 90% of the time for their hay fields. Order “Farmers Choice” to get a no-worry, can’t go wrong field like most farmers are using right beside your field — without paying $6 per pound to get them! This mix is specifically designed for the southern 2/3 of Illinois where the annual legume, Korean Lespedeza, blooms profusely in the summer (a baby chick’s dreamland) and produces tons of grain just in time to fatten up the birds for hunting season. With these characteristics it supports a huge population of birds -- so most will escape the hunters’ guns and be real fat going into the winter, ready to be population multipliers next season. Quail can’t get it any better than this! Plant it as a border around your crop fields and they’ll have perfect nesting and winter shelter as they glean the row crop field all fall and winter – wow! They’ll sure be fat by hunting season and ready for a long winter. This mix includes a cool season grass to provide early cover, grazing and fresh tender nesting material. Warm season short bunch grasses are research proven to provide the openness at ground level that is so critical for the baby checks to maneuver around in. This mix will hold up the snow to provide a warm haven for shelter. Includes a wildflower (forb) combination that is tall and short, legumes and non-legumes. They’re easy establishers that will draw in tasty insects not only for the baby chicks but for hens as well. What a delight for pheasants! This mix provides a nesting castle and a winter strong hold surrounding a crop field full of grain – it’s any pheasant’s dream come true. Provides an early season grass for early cover and nesting. And, it includes just the right amount of warm season bunch grasses to provide open ground area for baby chicks and switch grass that stands as strong as a light pole and spread eagle like a shrub to give pheasants the protection of a Hotel Hilton! A heavy dose of wildflowers (forbs) and mostly legumes generates insects like crazy so the baby chicks have plenty to eat. Order this mix today, empty the freezer and get ready to stock it with fat, juicy pheasants next hunting season!